Fifa president Sepp Blatter says Brazil's preparations to host the 2014 World Cup are on course despite not following "exactly what they promised". In 2007, Brazil became the only candidate to host the tournament after Fifa previously announced it would be held in South America. 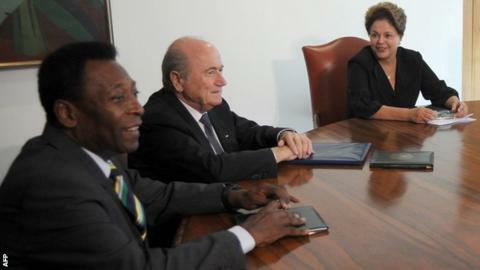 "They will do it, but it is not so easy in Brazil," Blatter said. "It is not so easy because in different cities they have not followed exactly what they have promised to do." Brazil have been dogged by allegations that stadium developments and infrastructure improvements have fallen behind completion time targets, with Fifa secretary Jerome Valcke being criticised in March after he claimed the nation needed "a kick up the backside." Despite the concerns, Brazil's deputy minister of sport Luis Fernandes told the BBC last month that all construction and renovation work on stadiums, airports and transport infrastructure considered "essential" is on schedule, but admitted the possibility that "non-essential" work will not be done before the opening game kicks-off in June 2014. "So now, we have a lot of time to recuperate," Blatter added. "It is not only the stadia, it is the hotels, the roads, airports but they are doing well." Will Brazil be ready for 2014? Read more on Will Brazil be ready for 2014?